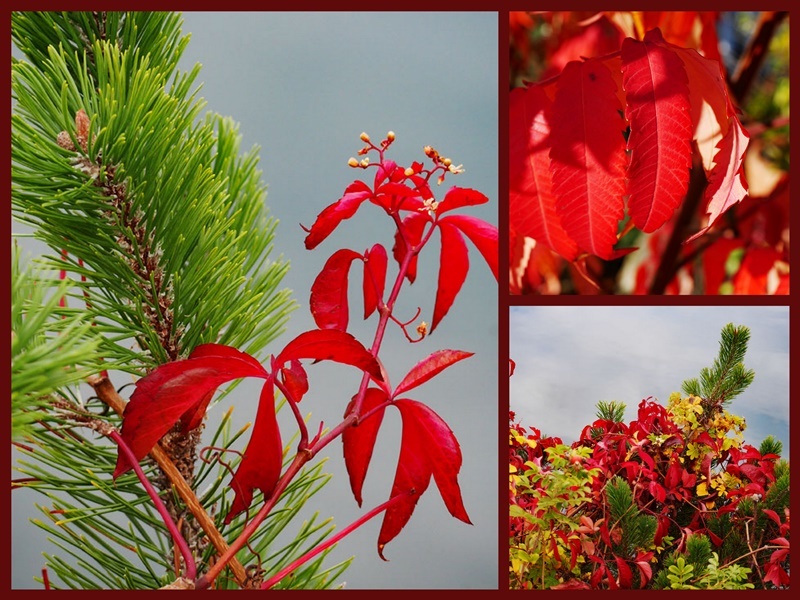 Although we don't have wildly stunning colour shows of autumn trees here on the west coast, some foliage does display the rich, tawny shades of autumn. A recent walk along the waterfront in the small town of Sidney, just north of us, revealed plenty of fall evidence. 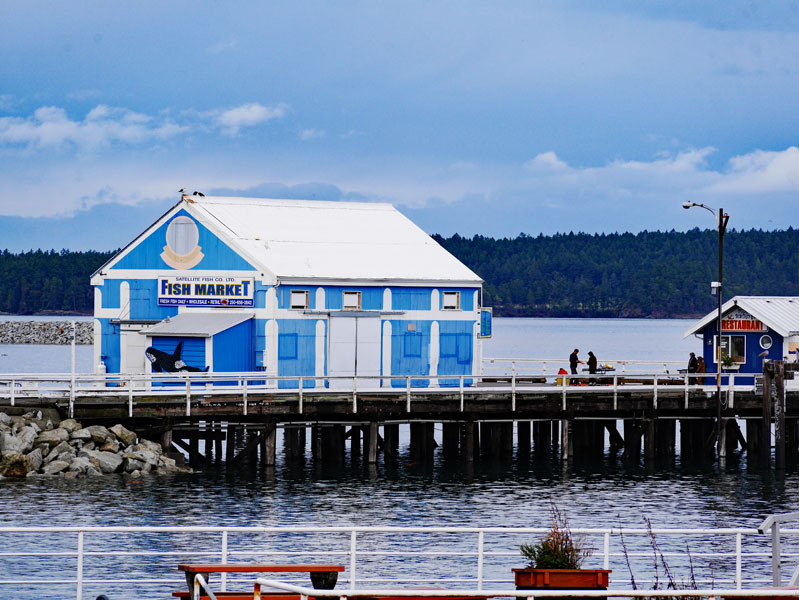 The fish market's bright blue is hard to miss. We enjoy the occasional meal at the small restaurant to the right of the market. There's a great view over the water and good food, too. Nathan Scott is a local sculptor whose first public commission was this Old Man by the Sea. He used his father as the model for the statue that shows an old man intent on tying his fishing lure to his line. The flowers in his hands are placed there regularly by passersby. I see that someone has placed a scarf around his neck, now that autumn is here. There are several of Scott's sculptures around the area and all are perfectly fitted for their setting. 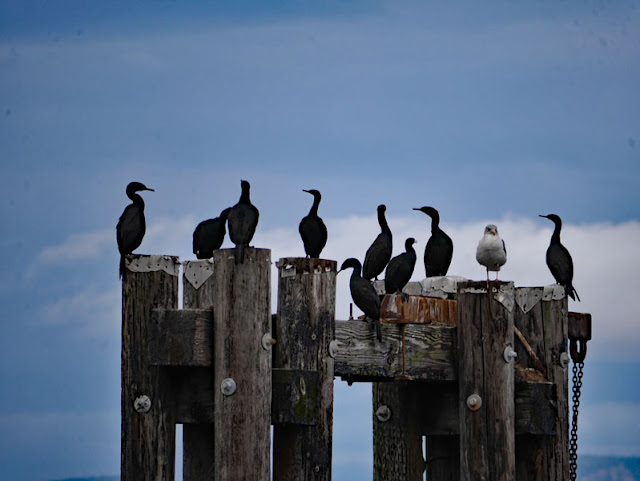 These colours are seen in every season - black cormorants, white gulls, old grey pilings against a blue/grey/cloudy sky. More traditionally autumn colours reflect in the water along the pathway. 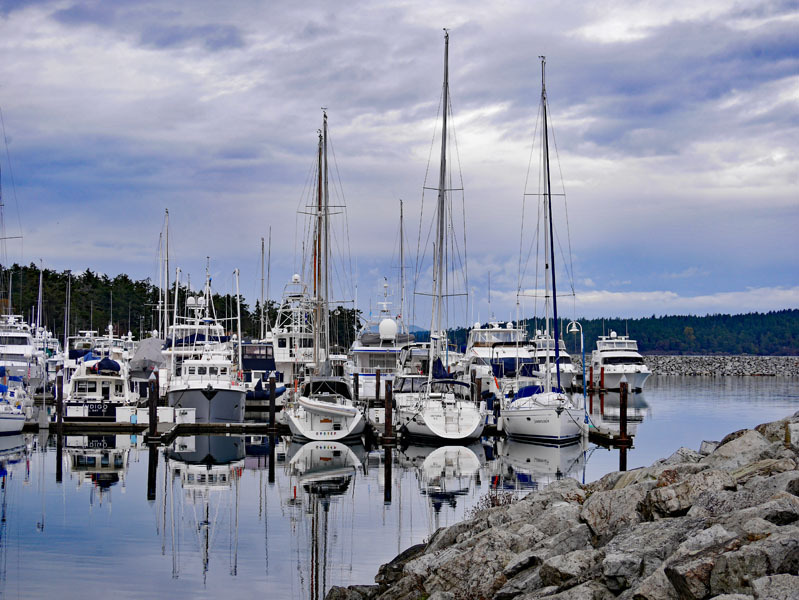 White sailboats lie still in their moorage at the marina, perfectly reflected. This pretty song sparrow blends into the patch of golden autumn grasses. Isn't his colouring beautiful? He played the coquette with me, turning his head back and forth too swiftly for me to capture his face. Autumn colours: rich, subdued, flamboyant, muted - there's something for all tastes in this wonderful season! Here I am waking on a wet and cold Monday morning in Normandy and you're probably getting ready to go to bed over there on the island, yet we are connected which is something I treasure. Sidney looks like the sort of town I'd love to visit, your photographs are wonderful, I especially like the boats and the boathouse shots. Beautiful photos. I love the reds in your first mosaic! Such beautiful photos, looks like a stunning place to visit whatever the season but certainly Autumn with all its spectacular colour brightens up the dullest of places. What a wonderful gesture putting flowers and a scarf on the statue. That is an exquisite capture of the song sparrow -- did you use your telephoto for that or were you able to creep up quite close? The traffic light colours in the first mosaic of vivid red, green, and yellows are stunning. I love the fact that the sculpture is nutured and loved within the local community. Yes, yes...I do like the sparrow in the autumn grass!!! And the sculpture of the Old Man. The colors are vibrant in all your mosaics..
Wow! Beautiful Autumn images of Sidney. The "Old Man" is wonderful. I think I'd really enjoy a visit to Sidney. Have a lovely week. Beautiful photos of your gorgeous surroundings, as always. I miss living close to the Aegean, with its permanent residents of sailboats, seagulls and sand and so your images are especially appreciated on this cold and grey morning in suburbia. I am enchanted with Nathan Scott's sculpture! The fact that passersby are so thoughtful as to make sure that the Old Man by the Sea is warm and cozy for autumn is so endearing. The sculpture is fascinating and perfect for an area by the sea. How nice that people think enough of the old man to give him flowers and now a scarf with cooler weather. Wonderful eye for these photos you took Lorrie. I always enjoy seeing sculptures dressed up nicely. Great capture of the Sparrow. Love the shot with the distillery in the background. Have a good week. Fabulous photos! I laughed at the sparrow keeping his head turned away from you - I have lots of photos like that! What a fabulous selection of photographs, the colours in them are brilliant. My favourite is along the pathway and all those gorgeous reflections. love the boat and ocean snapshots. Your Autumn colors are all stunning! Oh the reds in the first collage, the water front, the statue with the addition of the scarf and flowers. What lovely, lovely photos. Yes, that bird is beautiful! Looking at your beautiful photography, I find myself if I would recognize an October sky over a July one say based on birds and sky alone. I looked at today's skies and recognized them as "Novembery" ones. Whatever the season, your corner is a wonderful one. 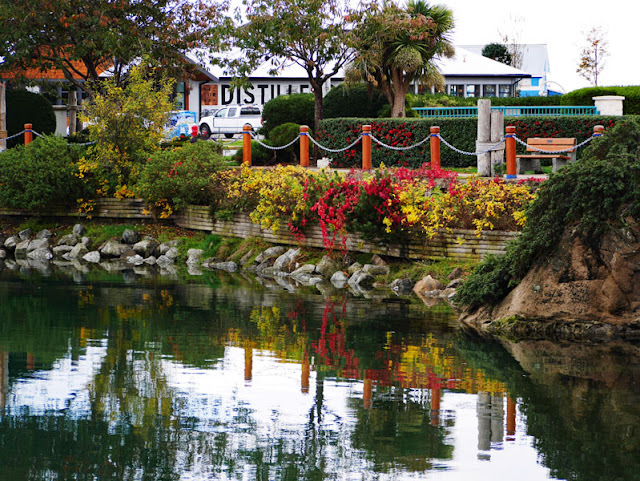 The fall color along the seaside walkway is lovely ...really everything about your area is great. And even if you had no fall color at all, it wouldn't matter, because you do have the sea and that makes everything perfect. ! So beautiful. And the statue is wonderful I love that someone gave him a warm scarf! Autumn looks very beautiful in your part of the world, Lorrie! The blues of the water and sky compliment the rich greens and reds of the leaves. The old man and the sea sculpture is charming. My father loved to fish and there was something very familiar and nostalgic to me in the sculpture's pose. Hi Lorrie, love your photos. Dressing up the sculpture makes him come alive. Beautiful scenes. Being such a visual person, this post is a feast for the eyes. I love seeing these lovely scenes from your corner of the world. Beautiful photos and post Lorrie. I like the statue. I think I'd enjoy a meal at that restaurant on the wharf! You captured the fall moments beautifully, Lorrie. Ernest Hemingway would approve of the statue. Your photos are so beautiful, it is still very green here, I miss Autumn. Hi, Lori. You may not have blazing fall colors-- nor do we for the most part. Not like New England--, but you do have awesome shore lines and beautiful water scenery that you can enjoy year round. Such beautiful pictures Lorrie. Your images capture a real feeling of autumn. I love the statue and how people have added flowers - and the scarf - to it. The mixture of seabirds is a wonderful shot too, I love their shapes. Enjoy the rest of the season. I love your Old Man by the Sea, Lorrie, and that admirers leave flowers in his hands. But true love must have given up that pretty green scarf for his neck! What beautiful color Lorrie! I love the sculpture with the scarf accent. Have a wonderful weekend.